Durability, affordability, and availability have made tile a choice material for DIY homeowners. Unfortunately, any material that lasts years like tile will develop layers of hard-to-clean dirt. Even if you try to clean your surfaces daily build up will still occur. Steam cleaning is 99.9% effective at removing bacteria and germs while breaking down the built-up grime. The steam penetrates the porous nooks and crannies of tile and grout better than any scrub brush. The hard part is choosing the right tile steam cleaner for your home. To help you narrow down your choice of steam cleaners, ask yourself a few questions first. Are you removing light layers of dirt, heavy build up, or spot cleaning hard to clean messes? Do you want to clean surfaces other than tile? Do you have children, pets, or other constant mess makers in your home? Would you be interested in an all-in-one vacuum and steam cleaner? Would you like the option of a disposable pad? Do you prefer continuous steam or to have steam on demand? Keep your answers in mind as look at the descriptions of the steam cleaners featured below. Your answers will help you find the unit that will best meet your steam cleaning needs. 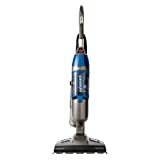 Sanitize and steam clean your sealed hard flooring surfaces with the Bissell PowerFresh Deluxe Steam Mop. It can safely be used on hardwood, linoleum, ceramic, tile, marble, and granite. The washable microfiber pad will safely rid your hard floor surfaces of daily dirt and dust build up. The detachable SpotBoost Brush targets tough dirt and debris build up powering them away. As an added bonus, the fragrance disc will freshen your air while you clean your floor. Continuous steam begins in just 30 seconds from being turned on. You can control the amount of steam you use by setting the steamer on low or high. For a light dusting the low setting is the way to go. For deeper cleaning, you will want to use the high setting. Weighing only 6 pounds this unit is light-weight making it easy to move from room to room. The swivel head allows you to easily clean around corners. The large attached 16-ounce tank can be filled using the included measuring cup. As an added convenience, the measuring cup attaches to the steam mop for easy storage. 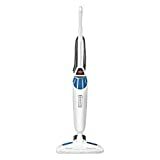 The Bissell Powerfresh Deluxe Steam Mop is a great option if you are looking to clean only tile floors and other sealed hard flooring surfaces. The detachable SpotBoost Brush, large tank, two steam settings, and fragrance discs are added features that make this unit a step above the rest. Sealed hard floor surfaces and carpet can be cleaned and sanitized with the Bissell PowerFresh Steam Mop. Washable microfiber pads safely remove dirt and grime from ceramic tile, linoleum, granite, and marble floors. Just simply attach the carpet glider tool to refresh your carpets. The tool will allow you to easily glide over the carpets while sanitizing every fiber. The Bissell PowerFresh Steam Mop is ready to tackle tough messes quickly. You have the option of using the flip-down easy scrubber or a microfiber scrubby pad to remove stubborn dirt and build up. For regular cleaning, a soft microfiber pad is included. All the pads are machine washable and reusable. The Bissell PowerFresh Steam Mop does not just refresh your floors. The fragrance discs will leave your air in your home smelling fresh. Three steam settings allow you to choose the right amount of steam for your job. You can choose from low, medium, or high steam. It takes only 30 seconds for a continuous stream of steam to begin. This unit only weighs 6 pounds and has a swivel head that allows you to get into the hard to reach areas. A huge benefit to this model is the removable water tank. It is a large 16-ounce tank that removes for easy filling and refilling. The Bissell PowerFresh Steam Mop will sanitize and clean your sealed hard flooring surfaces and your carpet. The removable tank, scrubbing options, and continuous steam settings are features that make this unit a good choice for those serious about sanitizing their floors. Cut your cleaning time in half by vacuuming and steam cleaning at the same time! Safely vacuum and sanitize sealed hard floors including hardwood, tile, ceramic, linoleum, marble, and granite with the Bissell Symphony Steam Mop and Vacuum. Machine washable microfiber pads eliminate the need for purchasing additional cleaning pads. With the option to choose high or low steam output you are in control of how much steam you are using. The on-demand steam allows you to decide when and where steam is released. The steam function can be used alone or with the vacuum. Weighing 9.74 pounds the unit is not as light-weight as models that do not include a vacuum. The attached 12.8-ounce tank has an easy fill opening to make filling and refilling easier. The Bissell Symphony Steam Mop and Vacuum simplifies your floor cleaning regimen by allowing you to vacuum up loose dirt and debris while you steam clean your floors. The vacuum function makes this unit an option for those who would like to eliminate the need for multiple cleaning tools. Sealed hardwood, ceramic, linoleum, granite, and marble flooring surfaces can be vacuumed while being steamed with the Bissell Symphony Pet Steam Mop and Vacuum. Pet hair, loose dirt, crumbs, and debris are quickly whisked away by the vacuum while the steam sanitizes the floor. Disposable pads are included for those messes you just want to throw away. Everyday messes and those that need just a little more scrubbing can be cleaned using the machine washable microfiber soft pad and microfiber scrubby pad. If your job is too big for the pads alone, the detachable steam booster tray will give you the extra power you need. You can even remove odors from the air with the scent discs. The on-demand steam system puts you in control of where and when the steam is released. Simply locate your target area and press a button to release the steam when you are ready. The high and low steam options let you decide how much steam you need. The unique steam system can be used at the same time as the vacuum or by itself. 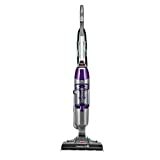 A little on the heavier side the vacuum and steamer combo unit weighs 9.74 pounds. It does offer separate wet and dry tanks. The dry canister release drops open to empty the dirt keeping your hands clean. The water holds 12.8 ounces of water. It is an attached water tank with an easy fill opening. 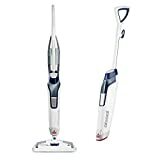 The Bissell Symphony Pet Steam Mop and Vacuum is a unique two-in-one system that allows you to vacuum and steam clean simultaneously. The vacuum, on-demand steam system, steam booster tray, and disposable pads set this unit apart from the others. Is steam cleaning really a healthy way to clean? Household chemical cleaners can cause illnesses in those inhabiting the home. Using steam removes 99.9 percent of germs and bacteria making the environment healthier for everyone. The steam reaches 175 degrees or more which kills 99.9 percent of germs and bacteria. A quick pass over an area will not be effective at killing germs. The area must be targeted and the steamer’s manufacturer’s instructions must be followed. My grout is really dirty. How can steam get it clean when scrubbing has not worked? Steam penetrates all the little holes in the grout. The pressure from the moisture and steam pushes all the dirt, mold, and grime to surface where the steam washes it away. The heat from the steam sanitizes all the newly cleaned pores. If the build-up is really bad you may have to repeat the steam treatment in that area. Continue treatments until you no longer see the dirt being released. Can I clean all my tile surfaces with the same steam cleaner? Every model will vary on the types of surfaces it is safe to steam. Look for units that specifically state they are safe to use on your type of tile or other surface. If the steamer descriptions are not clear on the types of surfaces that are safe to steam using their unit look in the user manual prior to purchasing it. Should you still have questions, contact the company directly at the toll-free number in the user manual. In addition to choosing a top steam cleaner designed for tile, make sure you choose a model that has all the tools and attachments you need for sanitizing your home. Above floor cleaning units have flexible hoses, removable tanks, targeting spouts, and more to make it easy to get in all the hard to reach places.